A decade on from Ronaldo’s hat-trick at Old Trafford, in one of the greatest ties the Champions League has witnessed, his Portuguese namesake returns to the club that made him great for a fixture that has mouths watering across Europe. It has been ten years since arguably the two biggest clubs in football last met, in the Quarter-Finals of Europe’s elite competition, in a tie decided by the brilliance of the ‘Brazilian Ronaldo’ as he has come to be known, with the latter prominence of Cristiano Ronaldo. The former Manchester United man warmed up for his first game against his old club by firing a hat-trick past Sevilla at the Bernabeu. Manchester United in turn opened up a unassailable-looking twelve point lead at the top of the Premier League with an assured 2-0 win over Everton, and the fortunes of the two clubs in their respective leagues could not be more greatly contrasted. United have bounced back from the agony of letting the title slip to the noisy neighbours last season by amassing their highest ever number of Premier League points after 26 games. Real meanwhile overcame the might of Barca last season, yet their resulting hangover sees them lie in third, trailing Barca by 13 points and even behind local rivals Atletico. This means that for their separate reasons, each can exert their every focus on this tie, with domestic concerns cast temporarily aside. Each side has their clear talisman: no one knows more about the threat posed by Cristiano Ronaldo than his former team-mates, yet this does not mean they have more chance of containing him than any other team. 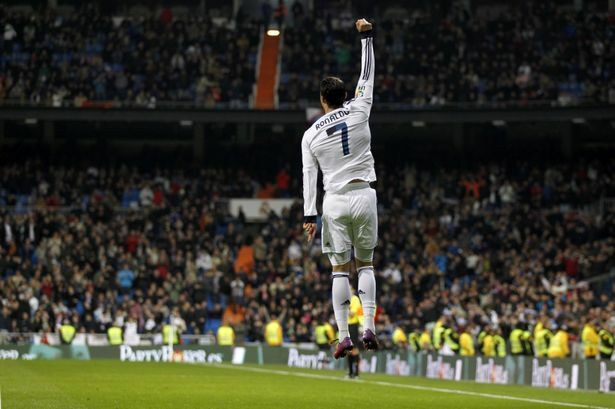 Ronaldo will exploit any space available, and there will be plenty available at both grounds. His ability and determination to run at a back four time and time again for 90 minutes make it almost inevitable that he will at some point be involved in a goal. Robin van Persie meanwhile has made a flying start to his United career, breaking the 20 goal mark already and drawing plaudits from all corners. The game however will come down to far more than these two goal-machines. Real Madrid have been as formidable at home as usual in the league campaign so far, yet have already lost five on their travels; if United manage a result in Spain’s capital they will have to be favourites at Old Trafford, where they have only failed to win once in the league all season. United’s issues in defence have been repeatedly highlighted, but with the return of Nemanja Vidic the back four has begun to look more secure, and it is far more likely that Real will look to exploit a midfield that, with the possible exception of Darren Fletcher, has missed a true ball-winner since the days of Roy Keane. The importance of Michael Carrick’s presence goes far too frequently unnoticed, yet a midfield that lacks mobility has been highlighted in its deficiencies against the passing carousel of Barcelona each time the sides have met since United’s victory in 2008. Facing a team that move the ball forwards as quickly as Real like to, combined with the lack of speed and bite United possess in the middle of the pitch could expose them to the likes of Ronaldo and Di Maria repeatedly running at the back four. Should United exert pressure and find a way to stop Ronaldo, they have their own quality in attack, with Rooney and Van Persie in rampant form. These are two of the world’s biggest forces, both built on a mentality of attacking, attractive football, and with United twice suffering heartbreak at the final hurdle in the last four seasons, and Real seeking their first European title since 2002, both sides will be desperate to advance; this will be no flaccid Last 16 tie. United’s performance at the weekend was indicative of a side under Ferguson who do not make the same mistakes twice. When asked by Dan Walker in a surprisingly open interview this weekend what would happen if a similar occurrence to last season’s 4-4 draw with Everton, Ferguson simply replied ‘it won’t happen again’. However this tie is not a game where mistakes can be repeated. With it being so long since the sides met, much will be new. More fresh is the rekindling of the old rivalry of Ferguson and Mourinho. Since the two first met, with Porto’s victory over United in the 2004 Champions League, Mourinho has six victories to Ferguson’s three, spanning the former’s tenures at Porto, Chelsea and Inter. These days the off-field relationship between the two is a more friendly one than the days that saw top of the table Premier League clashes, with the pair meeting for an amicable cup of tea when Real visited Manchester City in November rather than the verbal jousting of old. But this doesn’t change the furious determination and hunger of both managers; it is what breeds their success and this hunger channeled into two such talented sides will boil into 180 minutes of electrifying football. With both seeking Bob Paisley’s unmatched record of three European Cups, don’t bet against whichever giant emerges from this battle victorious going on to lift the trophy at Wembley. This entry was posted in Previews and tagged bernabeu, bob paisley, carrick, champions league, dan walker, di maria, jose mourinho, la liga, manchester united, premier league, real madrid, ronaldo, rooney, sir alex ferguson, van persie, vidic by The False Nine. Bookmark the permalink. Cracking article, Freds. Let’s hope your optimism about our chances of a result at Old Trafford is not unfounded!